i always knit while at craft fairs and since i had nothing on the needles saturday – i finished the small movie projects – i grabbed a very very pink ball of malabrigo that my friend sue passed onto me and some dark green to compliment it. interesting trivia about me… not only have i never made a sweater (not including the early one that languishes in the frogging pile – bad yarn/pattern combo among other things), but i also have never knit with classic malabrigo. it was, needless to say, a pleasure and a big thank you to sue. that said, i don’t think i’ll ever turn into one of those people who values softness (or malabrigo) above all else. the variety of texture, loft, elasticity, durability etc. that we get as people who love fiber makes my experience richer. the theory (that, in my opinion seems somewhat pervasive) of all things soft and fragile makes me go meh. 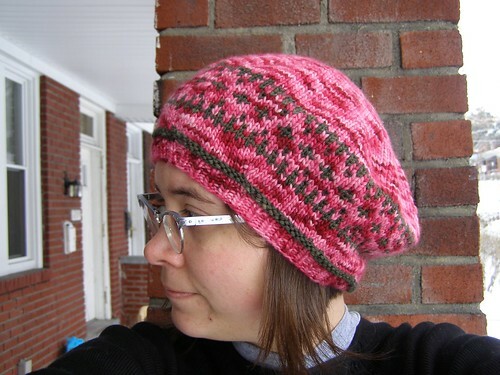 that said, i’d invest in a skein of malabrigo here and there… a fabulous knit and fun colors. plus i’m always a sucker for kettle dyeing. 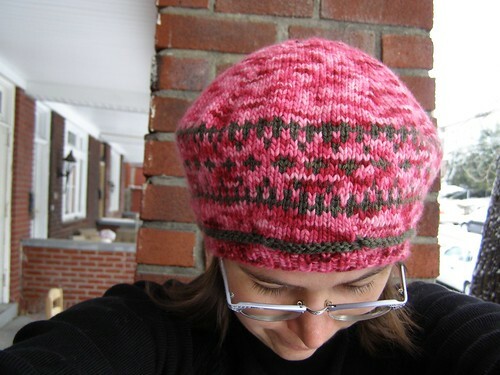 anyhow, minirant aside, the picture above is of me trying to take a good picture of the top of the hat where i did the little sunburst and here’s a better shot. so, i thought i’d be schmancy share the train track chart with you all. it is worked over a multiple of 4 stitches and 17 rows in the round. 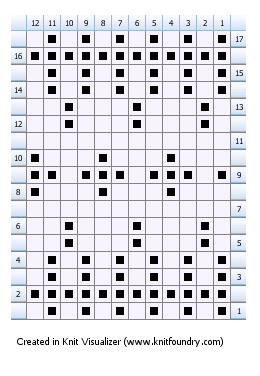 charts are read as you knit – bottom right to left and up. here’s a brief recipe – what i did to make my tam. i cast on 90 stitches, k1, p1 rib for about an inch, increased evenly 6 stitches every round for five rounds, did the chart and a couple more rounds, then i decreased 6 stitches every other round until i decided it was tall enough, then brought it in faster by decreasing more than 6 stitches/round. 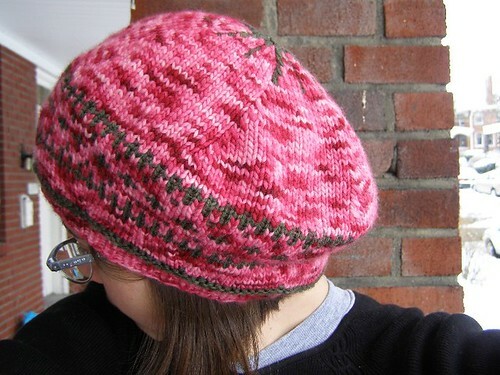 it’s a basic tam shape – if you need more explanation, read through my train tam pattern. 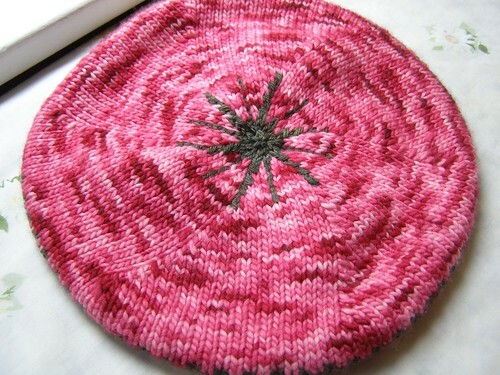 knit visualizer is fun :) and i’d love to see if anyone plays around with this. p.s. i put a pdf version on ravelry if you want to download it over there and gussied up the pdfs of all of the other freebies. I totally dig that little splat on top! I agree. I love the malabrigo I used for my Wicked, but I’m not sure how much I love the fabric it produced. It’s sort of saggy, and pills if you look at it funny. The rough and tumble woolliness of Jamieson’s, though, I will love forever. Ah, I see you have discovered the crack, I mean, Malabrigo. I don’t think I’d ever use it for a major garment, but it’s so pretty and soft. I love it! What a gorgeous pattern. You have such an eye for cute colourwork. Thanks for sharing it! oh, it’s lovely! thanks for making the patterna availible!